If you’ve been to any comic convention, consider Star Wars Celebration to be THE convention for all things Star Wars. It’s that simple! If you haven’t been to either, Star Wars Celebration is a gathering of people that love the franchise. This group includes celebrities, the people that helped make the movies and shows that we love, authors, artists, venders, cosplayers, and fans young and old. When you attend, you can shop the massive exhibit hall for shirts, art, collectibles, and all things Star Wars. You can go to panels to be part of discussions about the universe. You can listen to celebrities speak, or meet them for autographs and pictures. And there are often other activities throughout the con, like VR experiences, games, crafting and art spaces, and more. For some, it’s a five day experience. For others, a single day of con is sufficient. And for the die-hard Star Wars fan, this is an event that might be planned for years. (1) Get close as close to the Star Wars universe as you can (without being at Disneyland or Disneyworld). The universe of Star Wars is full of alien worlds that many of us can only dream of ever visiting. However, many aspects of the franchise come to life at Celebration. The best cosplayers will make you feel like you are meeting the characters in real life. Some cosplaying groups also build sets and replica vehicles to explore and photograph. In 2019, Disney was also on the scene with an entire area devoted to its new, immersive Galaxy’s Edge land. Unless you are lucky enough to be able to visit one of the Disney parks, this is the best place to lose yourself in the world of Star Wars. (2) Meet new Star Wars friends. I promised myself in January that I would publish more personal posts this year, but despite going through some very difficult stuff since 2019 started, I haven’t written a peep about myself. It’s most because sharing failures online is extremely difficult, and partially because I don’t want to feel like I’ve overtaxed my “complaints” quota for the year. However, I’ve come back around to this idea because I think sharing our struggles and failures might encourage other people in the same boat. And while it might not be relevant to travel, it’s part of my story, for better or worse. In January, I was working as a contract research analyst, and my contract was ending in February. However, I was assured that my position would turn into a full-time position, as my boss was leaving, and they needed someone to man the helm of my project. I was extremely excited. This was everything I had wanted. It let me keep doing research, while also developing skill sets that are valued outside of academia. Unfortunately for me, it wasn’t to be. Less than a week before my contract was up I was informed that no money had been set aside to hire me. I felt like I was dealing with a bad breakup… the sense of hope and excitement that I felt at the very beginning of the New Year still haunts me when I consider where I am now. I needed to mourn, and honestly, still am. But at the same time, I put myself through some emotional hell in order to put in a last ditch efforts to defend my post. I was hopeful out of desperation, but the headaches and restrained tears amounted to nothing. And I had gone from nearly having a dream job to having… nothing. Ever since then, I have been submitting application after application. I’ve taken classes on how to apply better, reached out to my network, and I’ve poured my soul into cover letters. In two months, all it has amounted to is one interview, for which I was rejected. My previous supervisors and professional network do their best to remind me that this is normal, and that all this is not a reflection of my quality as a researcher and professional. I know all the stats about finding a job by applying, and how key it is that you know someone where you are applying. But as much as I have worked on developing a professional network, no one I know has any leads. So, I can’t help but internalize all these rejections as failures. At the same time, I must admit that I have committed the cardinal sin of comparing myself to other people. I feel lucky to even get a straight up rejection instead of being silently tossed in the trash, and interviews seem out of the question. Meanwhile, I see other grad students graduating and heading straight into great post-docs and academic positions. I’ve even seen people on a PhD job search support group say that finding a post-doc would be “so easy” for them. If everyone else can seemingly do it, what’s wrong with me? Inevitably, this had led me to a place where I realize that I have developed imposter syndrome in many aspects of my life. I earned my PhD in conservation biology, but I don’t feel like a scientist. Five years ago, I thought getting my PhD was impossible, and then I did it, but now I feel like this isn’t enough. I haven’t found a post-doc. I was never funded by NSF. I don’t have as many publications as other scholars. I don’t write and talk in stilted, science-speak. I love hiking, but can I call myself a hiker? I don’t have the best gear. I can’t always force myself to go longer trips. I am slow. I get tired. Sometimes hiking even gives me a migraine. I’ve been blogging for almost two decades, but can I apply the label, blogger? I don’t have tons of followers and readers. My social media accounts have stagnated in terms of growth. I don’t have the time to master SEO. I’m not charismatic enough to pull people in with my smile alone. This undermines my confidence, and makes me feel like an outsider even in communities and spaces where I have spent a decade or more. When will I ever feel like I have earned these titles? Probably never, unless I decide that I can claim them. I know it is easier said than done, and I don’t know where I will be in a few months or the end of this year. Will I feel like I am back on track towards the life I want to make for myself. Or will I feel more lost than ever? I can’t say. Rejection and imposter syndrome go hand-in-hand, and I don’t think I will escape the first any time soon. So, I guess it’s just high time I start making the claims I know I deserve, whether or not I can believe it about myself yet. I am a scientist. I am a blogger and writer. I am an outdoors woman. I am an explorer. I will let you all know how this leg of my journey goes. The Seven Springs trails are a great place to spend the day, or a weekend for both Phoenix locals and visitors to Arizona. It’s slightly cooler than the city due to its higher elevation (and distance from the city “heat island effect”). And there are some beautiful oases among the mountains where the spring runs. For locals, Seven Springs is relatively close; from central Phoenix, it’s about an 1 to 1.5 hours away. However, its proximity to the city doesn’t mean that it isn’t a refreshing break from the urban landscape. As you follow the dirt road back into the Cave Creek mountains, you will find yourself heading deeper and deeper into a more grassy and green dryland than can be found anywhere else in the Phoenix-area. When you are close to the spring, you will also be delighted by the splash of green trees that have grown up surrounding the water source. While it isn’t a particularly cool place in the summer, during the spring and fall it is a great escape from the heat for hikers, campers, and picnickers alike. For travelers visiting Arizona, the Seven Springs trails represent some very unique vistas and great hiking experiences. Whether you are just visiting Phoenix for a few days, or exploring Arizona more thoroughly, this area will give you the chance to see the impact of water on the desert, shaping the mountains and growing vibrant, green forests so striking you won’t believe your eyes. Short drive from the city for a beautiful escape; you won’t even remember that Phoenix is right around the corner! Views of a unique desert landscape that lives between the drier Valley of the Sun and the higher forests and scrublands of northern AZ. A peaceful place to picnic and explore a spring in the desert. Plenty of trail options for people wanting to hike short and long, and all kinds of different vistas along the way. Camp grounds on-hand and nearby to lots of good restaurants in the Cave Creek area so you can make a day of it. While there are many options among the Seven Springs trails, my favorite loop is a mix of Trail 4 and Trail 246. This loop feels very long, so it isn’t necessarily an easy hike. But it does bring together many of the best views of the area, and lets you both explore the spring and head up into the grassy hills and mountains. It’s also fairly easy to navigate (but for a few parts which I will explain below). If you are looking for a day hike, this is definitely a great option, and if you’d like a shorter hike, I would suggest starting on Trail 4 and just turning around when you start to get tired. Length: ~10 miles; our GPS’ could not agree on the exact length but it felt like 11-12 miles. Difficulty: Difficult. This loop is long and has sections with considerable elevation gain. Walking short sections of Trail 4 would be relatively easy, however, for anyone looking for an alternative option. Cost: Free (as long as you park at the Cave Creek trailhead parking area); elsewhere you will need a Tonto Pass, which is $8 and can be purchased in town (see locations to buy these here). For camping it will be $75 dollars, and you will need to either call 1-877-444-6777 or go to recreation.gov to get a permit. See more information here. Toilets at the trailhead? Yes; check Forest Service website for information on the bathroom’s status. You will need to develop your packing list based on what you plan to do while you are on the Seven Spring Trails. But here is my list of essentials. (1) Safety gear and first aid kit appropriate for the amount of time you will spend in the wild and the number of people in your group. (2) Food and water. Even though it is slightly cooler up here, you will still want to keep hydrated. This is an essential safety and hiking equipment for hiking in the desert (or anywhere). You’ll also want to bring plenty of snacks! If camping, plan your meals. (3) Good, broken-in hiking boots, and if you plan on walking through the spring, hiking sandals. (4) Maps of the area (you can find a basic one from Hike Arizona, here. (5) Clothing layers for a cool morning and hotter afternoons. In order to get to the Seven Springs Recreation Area, you will need to drive to north Phoenix, and up through or past Carefree. There are several roads that will take you up in the right direction, depending on where you are coming from. Most likely, you will need to take the 101 north and then get off on Pima, Scottsdale, or Cave Creek. Then you will head north until you hit Cave Creek Road or until Cave Creek turns east. Then you will just keep following Cave Creek as it winds back north, past the road leading to Lake Bartlett. Cave Creek Road will eventually turn into Seven Springs Rd, and the pavement will run out. The following dirt road feels fairly long for people driving cars, but it is do-able. I have driven that road with my little cars over the past decade pretty regularly. Just take your time and you will be fine. If you are in a vehicle with higher clearance, this will be no problem. That being said, there is flooding sometimes on the road, and the creek passes directly over it at a few points. So, no matter what you are driving, obey signs warning of dangerous conditions, and avoid crossing the water if it is too high. While there are plenty of options among the Seven Springs trails, I will be covering the 4/426 Skunk and Cave Creek loop here. Being as it is a loop, you can take it clockwise or counterclockwise. Either is fine, but I personally like the counterclockwise direction the most. This allows you to amble along the stream and really enjoy this part of the trail before hiking up into the mountains. However, you will need to be well aware of your hiking ability on this route, as it might be easy to feel like you can keep going while the trail is relatively flat and then get tired on the second half. If you go clockwise, you will do the hard part first, but when you get back to the stream, you will be pretty tired and you really won’t appreciate the slight uphill climb back to your car. There’s a bit of a trek from the parking lot to the rest of the trail system in the area, but it quite a lovely stretch. 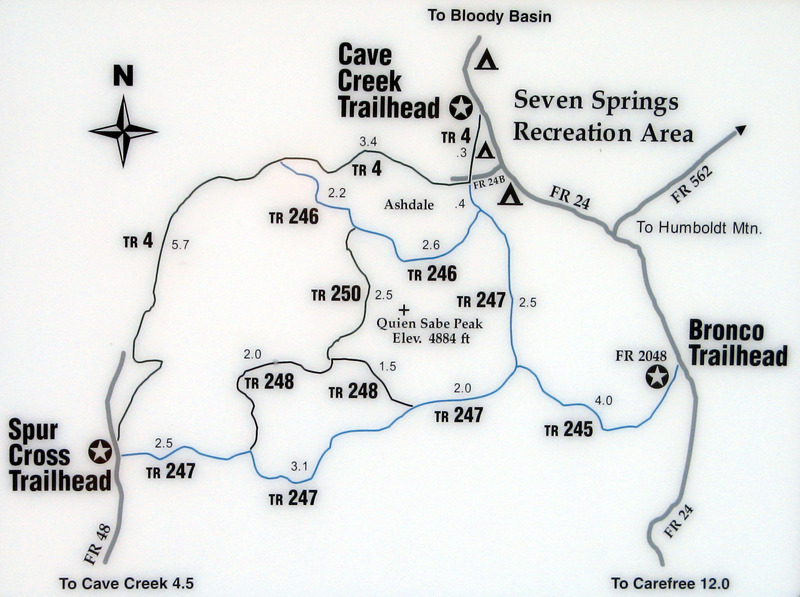 Before you leave, make sure to snap a picture of the map at the trailhead for further reference. Then you will walk up a steep stretch of the trail where you will catch some great views of campground and forest. While short, this part of the journey gives you a little taste of the alpine, with some evergreen trees and higher elevation scrub trees. Luckily, particularly for your way back, it’s pretty flat for here as well but for the initial elevation gain and the walk back down to the road at the end. Once you hike down from the higher parts of the trail, you will cross the road and then follow Trail 4 as it follows the creek. As you get to the bottom of the hill, follow the trail as it turned to the right, and cross over the cattle fence into the forest. You will then keep to the right and follow the trail through the forest of riparian trees that grow along the watered soils of the creek. This is a beautiful place to stop for a picnic. Shady places with flowing water are rare in central Arizona, and its always worth enjoying them when you have the opportunity to see one. As the trail continues on, the relatively flat bottom of the stream bed will narrow, and you will find yourself following the track along rocky cliff sides overlooking the creek. The forest will fall behind you and you will find yourself heading back down into the Sonoran Desert landscape. Saguaros are perched on the trailside, and while the water maintains a vibrant plant array, the trees will become more scarce. Eventually, the trail will take you right down to the stream, where you will have to cross over the water to continue on. While less shaded than the forest, this is another good place to stop for a snack and rest before continuing on through the desert. Just when you are wondering just how far it must be to the junction for 426, you will find a wooden sign pointing you up into the grass-covered mountains to your left. From here, you will follow the trail as it climbs its up and up… and up. While this is the most strenuous section of the trail, you will be afforded with exceptional views of the surrounding landscape, and if you look carefully into the stoney nooks to your right, you might catch water a glimpse of water flowing down the mountain side. These are places that remain dry for much of the year, but when there is snow melt or rain, they offer a special glimpse at the rate beauty of desert waterfalls. When you reach a saddle in the rolling mountains, you will pass the little grassy area that gives this section of the trail it’s name. Skunk Tank. Here, the stones of the mountain catch water and provide the plants and animals with water in an otherwise dry section of the mountains. From there, you will continue upwards for a time, crossing back into the land of puffy, short trees. The trail will widen at this stage, turning into something of a narrow dirt road, and this will take you back down towards the creek. The trail does get a little lost and hard to navigate once you need to cross the creek bed, so keep your eyes peeled for cairns and the familiar sights of Trail 4. Eventually, you should get back to the road, which you will cross again and then hit the first section of the trail back towards your car. (1) Always remember that your safety on the trail is your responsibility. Be prepared and be cautious. Bring food, water, sturdy shoes, and first aid equipment. (2) Always let someone know where you will be hiking and when you expect to get back. (3) Exercise caution as crossing the stream bed, the round rocks, particularly in the water, can be unstable and hard to walk across. (4) There are some large carnivores that live in this area, so be aware. You may wish to carry bear spray if you are worried, but also researching what to do if you run into any large predators can also be helpful. The odds are slim that you will see them, but it’s something to be aware of. The Pinnacle Peak hike is an insular island of mountain goodness tucked away on the northern edge of Scottsdale. The star of this hiking show is Pinnacle Peak itself, which will immediately dominate your view when you pull up and park. It isn’t particularly tall, comparatively, but this little peak is characterized by some really neat boulders and the rocky spire itself is definitely picture-worthy. Pinnacle Peak Park is a great place to take the family for a short trek to see the peak and some wonderful views of the McDowell Mountains. For regular hikers, it is also a good exercise trail and you will immediately see that it has more of a work out culture than a hiking one. You can also go rock climbing at Pinnacle Peak, but I have never been, so I would suggest checking out the park website for more info. Almost no matter where you are coming from in the Phoenix-area, you will need to head north to reach Pinnacle Peak Park. You can take the 101 to either the Pima or Scottsdale exit. Then follow either of those roads north. You will then take Happy Valley Rd to the east until you hit Alma School Rd which you will take north. Finally, follow signs to the parking area. The Pinnacle Peak hike calls Scottsdale, one of the richest parts of the city, home, and it shows. The trailhead has a very nice building where you can go to the bathroom and get information about the trail. There are maps available and staff/volunteers to talk to. Along the trail you will also note that there is very good signage for different landmarks. This is really nice for the photographers among us. There are also emergency markers along the trail. And there are volunteers that hike it every so often to keep an eye on things. Pinnacle Peak Park has some special rules that you will need to know before you head over there. In addition to the average rules and manners to keep in mind, they have some restrictions on hiking times and photography. This park has strict hours and you will not be allowed to hike when the park is closed. The hours change with the season, so reference the following link to see when the park will be open on your hiking dates. Commercial activities are not allowed in the park, and that includes photography that will be directly used for commercial purposes. As I mentioned previously, volunteers do monitor the trail, so if you are planning on setting up an Instagram shoot, make sure that you are allowed at the information station. If not, you will likely get caught. The Pinnacle Peak hike has a trail culture that is becoming more and more common in Phoenix. Specifically, it is dominated by people who are either visitors or people working out. For old-school hikers, this means that you shouldn’t expect to see Leave No Trace or hiking etiquette. There also tends to be a lot of people on the trail and most won’t greet you like in less exercised-focused trails. The Pinnacle Peak Trail starts at a beautiful trailhead with all the amenities, bathrooms, maps, helpful volunteers, and water fountains. From there, you will pass through the metal gate that is closed off-hours, and begin winding your way up towards the peak itself. After making you huff a bit, the trail will give you a bit of a break as it takes you around the mountain. The path will turn away from the trailhead and climb up to the rock spire for which the park is named. It then snakes out across the boulder-covered mountain to the west. A bit more elevation gain and you will be up high enough to get some great pictures of the spire. There will also be views of Scottsdale and Phoenix stretching off in all directions. For some, this will be the place to turn around. But if you want to complete the trail, you will keep walking as the path dips down into the saddle between the spire and the rest of the mountains in Pinnacle Peak Park. You will then climb upwards again, before running into some signs that warn you about the difficulty of the rest of the trail. From here, should you decide to continue on, you will follow a steep decent back into the neighborhood. The hard part is that this trail is not a loop, so everything you just went down, you will need to get back up. Make your way back up the steep section of the trail. You will get a bit of a rest as you trek across the flatter parts of the path that come directly after. But your trek home won’t finish climbing uphill until you pass the spire again. Overall, all the elevation gain and loss makes this an impactful workout for its relatively short length. And the spire, Pinnacle Peak, makes it a unique place for visitors. For more information and inspiration on all things Arizona, be sure to check out our guide to our home state. I guarantee there will be places on there that you hadn’t thought about before. West Fork Trail is one of the most popular trails in Oak Creek Canyon, and for good reason. This 6-7 mile (3-3.5 miles in one direction) trek will take you through a beautiful side canyon. There, as you walk along the stream, you can enjoy a higher elevation riparian forest and a flowing stream. Both of these are rare in Arizona, thus locals love this area. Visitors to the state will also be treated to dramatic views of a pine-lined canyon with sweeping stone walls. In the fall, West Fork, Sedona gets even better, as it is one of the few places that you can see the trees change color in the state. In order to get to the West Fork Trail, you will need to take AZ State Route 89A, no matter which direction you are coming from. If you are coming from Phoenix, take the I-17 north to 179 towards Sedona. Once in town, you will come to a big round about with the 89A going in two directions, head north. West Fork is north of Slide Rock State Park on the left side of the road. If coming from Flagstaff, take the I-17 south until the junction for 89A and then drive down through Oak Creek Canyon until you reach the parking area. This will be on your left. There is a parking lot at the West Fork, Sedona trailhead, and it is $10 per vehicle to park. You can learn more about the permits and trail here. You do not need to purchase ahead of time, and this trailhead is manned during its hours, so you will pay when you get there, at the gate. Due to this, the trail is only open from 9a-7p. This trailhead typically fills up extremely fast, so I would suggest getting there at least 30 min before the trail opens. The website says that parking will be full by 9:30a, so you might also want to know of alternative places to go. Some people will park along the edge of the road, but this is dangerous, so it is not recommended. If you get there early and get in, there are toilets available for use at the trailhead. West Fork, Sedona, if you start from the Call of the Canyon trailhead, begins in one of Oak Creek Canyon’s grassy flats. After using the bathroom before you head out, you will head straight into the tree covered track and cross a sturdy bridge over the stream. Don’t get used to this, as this is really the ony bridge on the trail. The rest of the 13 creek crossings will be either across pebbles or just through the water. The trail will take you south down Oak Creek for a short time, before twisting to the right, into West Fork. Here, the canyon walls will close in a little bit, and you will find yourself following the creek even closer. Once in the canyon, you will soon find yourself needing to cross the stream. Having good shoes on will immediately come in handy. With waterproof boots, you will be able to brave the water in cooler weather. With sturdy hiking sandals, you can splash into the water in the warmer months and cool off. This first creek crossing is a great place for families to stop, if they have members that won’t be able to cross. There is lots of room here for picnics and you will already be able to enjoy the tree cover and beautiful canyon walls here. For those who continue trekking inwards, you will follow the trail as it weaves across the stream and twists along through the forest. The entire route is well shaded by trees. If you keep your eyes peeled, however, you will see all kinds of trees and shrubs, as Oak Creek sits in a transition area where the higher shrub forests give way to the pine forests that surround Flagstaff. Small mammals, many kinds of birds, and sometimes even deer may be apparent from the trail as well. In terms of elevation gain, West Fork trail isn’t particularly difficult. From start to finish, there is about 400-500ft gain, so while you will be climbing in places, it shouldn’t be exceptionally strenuous. Of course, that being said, you will need to navigate the trail as it goes down to the stream, back into the forest, and then down to the stream again. There are spots where you will need to deal with narrow sections of the trail and climbing up short spans of rocks. You will know that you’ve reached the end of the main section of the trail when the trail becomes completely submerged in the stream. Here, the canyon narrows even further, cutting off the forest from the water. People prepared to wade can keep going for some beautiful views of this part of West Fork, which resembles a slot canyon with its sweeping stone walls. People looking for an even longer trek can continue on through the canyon, however, most people turn around at this point so that they won’t require a shuttle. Your safety is always your responsibility. Do your research and always stay safe on the trail. West Fork Trail follows and crosses a running stream, so take all precautions necessary around water, particularly with children. The trail will cross the stream several times, so bring waterproof shoes or hiking sandals (Keens or Tevas) and cross with care. Make sure that your hiking shoes are broken in and fit comfortably. Bring extra food and water for your journey as well as first aid supplies. Avoid the heat and do not hike when it is above 100 F.
Listen to your body and don’t hike further out than you have the energy and strength to get back from. Flash flooding happens throughout AZ; avoid hiking during storms. Let people know where you are going if you are going solo. Don’t climb anything or stand on cliffs for selfies or photos. Bring sunscreen and hats! During some times of the year, bug spray will also be necessary. West Fork, Sedona is best visited at any time but the dead of summer. Even in Sedona, it gets dangerously hot in Arizona and I would not suggest going on a long hike during this time. Fall is an extremely popular time to hike the West Fork trail, and for good reason. This is the time to see all of the changing colors in the canyon. Spring is also a lovely time to visit, particularly on years when Arizona has good winter rains. This means that there will be a higher chance of wildflowers. However, spring weather in Arizona can be somewhat variable, so make sure that you check the weather before leaving. It does snow in the Sedona/Oak Creek area, so you may have to deal with snow if you go during the colder months. Depending on the year, however, the snow might come and go (or never really happen), so winter can be a great time for longer hikes in Arizona. It’s the best time to avoid the heat, particularly if the cold doesn’t bother you too much. I would be remiss if I wrote about any hiking near Sedona without mentioning that this area of Arizona is suffering from overtourism. This is a beautiful part of the state, there is no arguing that, but Sedona is often one of the ONLY places that travel bloggers suggest for my home state. Thus, everyone flocks there. In the past ten years, it has become harder and harder to hike and hang out in Sedona, and West Fork trail illustrates part of the problem. While this was always a popular trail, it wasn’t always necessary to get there before the crack of dawn in order to enjoy its sights and sounds. Like many (or most) of the trails in Sedona, this is a place where local people are being pushed out by all the visitors. It doesn’t stop at trails. The last time that I went to see the famous Chapel of the Holy Cross when some friends from New Zealand came to visit, I ended up having to drop everyone off and then sit with my car elsewhere because of the overcrowding. Traffic in Sedona can also be a huge issue these days. The last time I visited, there was a traffic jam that snaked its way all the way from downtown to out of the town. Luckily for us, we were on our way out at the time. In either case, just be aware of the conditions that you may be facing if you visit Sedona, particularly in the high season. While I understand wanting to go somewhere despite the crowds when you are visiting. It is up to travelers to help address issues of overtourism. So, if this is something that you are likewise concerned about, here are some tips on how to help address this issue. (1) Visit Sedona in the shoulder or off-season. Help spread out the love to more of the year. This also helps local tourism operators by creating less of a down season and supporting more jobs year-round. (2) Limit the length of your visit to Sedona. Make a list of the main things that you want to see, and then spend the rest of your time exploring other amazing places in Arizona. Believe me, this state really does have so much to offer people that visit, and it isn’t just in Sedona. If you want some inspiration, we have plenty of posts to give you ideas about some lesser known locations. (3) If you have to visit Sedona during the high season and want to spend most of your time there, be very contentious of the rules and be flexible. As visitors, we are just passing through, but our collective impact can make the lives of local people very difficult. In particular, parking can become a frustrating ordeal for everyone. Please, stay out of residential areas and out of dangerous roadside parking. (4) Keep yourself safe. It may sound silly, but travelers being unprepared and getting themselves into danger is a major problem on some trails here. Do everything you can to be prepared and safe so that emergency services aren’t being overwhelmed. Fifteen years ago, long before Instagram, Havasuapi was a far-away destination in the corner of Arizona. Plenty of people went, but the experience was far more secluded and peaceful than what you can expect now. Now, the average explorer and hiker might find themselves feeling more like an set piece on someone’s photo shoot than a traveler through a serene oasis. So, if you aren’t looking for Insta fame, or just aren’t a fan of the travel social media culture, is exploring Havasupai still worth your time? I’ve gone to Havasupai several times over the past 20 years, and I’ve personally seen the change from an remote camping destination, to a guided tour hotspot, and to the current social media craze. I can honestly say that I miss the days before this little spot in Arizona exploded, and I can seriously do without people monopolizing the falls for 30 minutes to an hour because they want the perfect photo of themselves. That being said, I’ve never once regretted visiting, and I still find the crowds manageable if you go during the shoulder seasons. (1) The brilliant blue waterfalls are even cooler in person than in the pictures. (2) The hiking in the canyon is amazingly beautiful from the trailhead to the confluence. (3) Camping in Havasupai supports a community of Native Americans who have been trying to make a living via a nature-based form of tourism that has ecotourism potential. (1) This is a busy and increasingly popular place, which makes it hard to get permits and people who prefer solitude will not find this spot enjoyable. (2) You will see first-hand the social media craze and the impacts of overtourism. If you’ve been previously, you will need to prepare yourself for this. (3) You may be exposed to unprepared hikers on the trek into the canyon or trying to climb down to Mooney Falls. This can increase your risk or potentially impact your trip. So, you’ve decided that exploring Havasupai is worth your while. Great! There are several key steps to planning for your adventure. (1) Make sure that you are physically prepared for 20+ miles of hiking. If you don’t have a lot of experience, get out on the trail and get your body into shape! Continue this practice throughout your planning process. (2) Get your permit. (See below). If you want to pay to have horses carry your gear down, you will need to set this up right after. The Havasupai have been trying to lessen the work that their animals are doing on the trail for welfare reasons. (3) Get your gear together. Here is the key packing list that I would suggest using as a basis. (0) Permit paperwork. ID, wallet, etc. (1) Hiking boots which fit well and are broken in. Opt for high tops as these protect your ankles and feet with the extra weight of your pack on. Hike at least 40+ miles in your boots before you take them backpacking. Make sure that your toes don’t hit the front. They should fit well enough to stop your feet from sliding inside the shoe. (2) Backpacking pack that is fitted to your body type. (3) Sufficient water (!!!!) and salty snacks that will be accessible for your hike in. Remember, Arizona is a desert and dehydration is a major danger. (4) First aid kit for the number of days you will be on the trail. REI has great options for this. Be sure to add extra blister care, bug spray, and sunscreen. If you have any essential meds, of course, don’t forget those! (5) Shelter- tent, hammock, etc. Whatever you are most comfortable with. I suggest a lightweight tent, sleeping pad, and sleeping bag. (6) Bring a head lamp for the night time. (7) Pack food for your time camping and everything you will need to cook. A small, light stove, fuel, cooking utensils, bowls, cups, and general utensils will all be necessary. Fires are not allowed. If you have it, bring a rat sack. If you can’t get one, you can ask for a bucket from the rangers at the camp entrance in order to protect your food. Hanging it will not be enough. The squirrels will get it. There is also a restaurant in Supai. (8) Bring extra clothing and anything you’d like to have on hand for swimming (swimsuit, hiking sandals like Keens and Tevas). Depending on the season, you might also need a jacket for the cooler nights/early mornings. You must have a permit to explore Havasupai. All permits must be reserved and purchased online. The tribe asks that you DO NOT call them unless you have a customer service matter. The first step to buying permits is registering an account on the Havasupai Reservation website. Do this before Feb 1st. As of 2019, everyone is required to stay for 3 nights and four days. There are NO day hikes allowed in the canyon, and people will be checking. Weekday nights are $100 per person, and weekend nights are $125 per person. One name is required for the permits, and whoever’s name is on the permit will need to be present at Supai for check-in. There are NO REFUNDS on permits. No matter where you are coming from, you will need to take the 66 to Indian Road 18. This is a little southeast of Peach Springs and north of Seligman after the Grand Canyon Caverns hotel (well-worth the stop if you like caves- not great formations, but just interesting). You will take Indian Road 18 all the way to its end. You won’t really be able to miss the trailhead. There will be tons of cars and the dry end of the canyon will be immediately apparent. There are bathrooms at the trailhead. The hike down to Supai and the falls has four main sections in my mind. Overall, from the trailhead down to the campground is around 10 miles. It’s 8 miles to Supai and then 2 more miles to the campground. At all points, be aware of and listening for the horse trains that move up and down the trail. Best to keep out of their way as they can move quickly and there are people checking permits that ride through as well. The first section is the steepest, and is the most difficult on the way out. You will descend down steep and dusty switchbacks all the way down to the canyon floor. At the top, there are some wonderful views of landscapes that you aren’t otherwise going to see. So it is a great spot to stop to take pictures before you get started. The switchbacks themselves aren’t particularly steep, but they will be a huff for most people on the way out. This can be extremely difficult for non-backpackers in the heat of the day when you are trying to leave. So plan accordingly. Also, when I say that this part of the trail is dusty, I mean it. There are parts where you will be sinking up to your ankles in the dust and it can be tiring to walk in. The second section is the longest stretch of the trail and will take you through the dry parts of the canyon. This is relatively flat, with some lost in altitude on the way in and some climbing out when you leave. Overall not particularly difficult except in its length. I personally think that this part of the trail is very lovely. There is a kind of desert desolation here. You will pass through short stretches without so much as a bush between the smooth, stone walls of the canyon. In other places, you will pass through patches of desert bushes and walk by impressively large trees rooted deep into the water running below ground. This part of the trail ends when the canyon opens up again, and you start to hear the blessed sounds of flowing water. The absolutely vibrant, green riparian forest will also come into view, beckoning you onwards. When you reach this point, you are very close to Supai. You will turn left (following a sign) into the woods. Here, in the shadow of the trees, the trail will follow along the brilliant, blue waters of the stream. Slowly, you will start to make out houses here and there, tucked away from the hustle of the trail. In Supai, you will need to stop at the tourism office to check in and get your wrist bands. This building will be easily apparent. There will be signs and it is in the most densely built up area of the town. Near here there are also restaurants, snack shops, and a gift shop! After Supai, you will be on your final stretch. You will follow the trail out of town, and continue to follow the stream for two miles downhill. Before reaching camp, you will start to see some beautiful waterfalls. Havasu Falls will be before the campgrounds to the right of a sharp decent into the canyon on another very dusty part of the trail. When you arrive in camp, you are allow to choose any open camping spot. If you want to explore Havasupai, but have some issues hiking and/or camping, there are options for you. If you are unable to hike to camp, there is the option of taking the helicopter in and out of the canyon. The flight is $85 each way (limit 20-40 lb backpack). You may end up needing to wait quite a while to catch a flight. So, if you decide to go this route, I would advise you to arrive very very early. If you are not up for camping, you may also consider the Havasupai Lodge. Reservations open on June 1, 2019, and rooms go for $200 a night. They are described as accommodating up to four people, however, I have never personally stayed in one, so be sure to check out the website and see for yourself. Camping sites are first come first served. There are bathrooms spread throughout, and a fresh water spring that you can safely drink from. The squirrels at the campground WILL get your food if you don’t bring a rat sack or store everything in a ranger-provided bucket. Absolutely DO NOT store food in your tent or backpack (unattended). The last thing you need is a squirrel chewing through your gear. Camp is also relatively close quarters, so be sure to be quiet and respectful of all your neighbors. Afterall, the quieter you are, the better you can hear the nearby stream flowing. While there are several falls to be enjoyed, Havasu is the one that you will see most often. This is most easily accessible from camp, and is a great place to hang out at, picnic, and swim. Exploring Havasupai doesn’t stop at camp, however. If you are a bit of an adrenaline junkie, and not afraid of heights, Mooney Falls is a short hike past the campground and then down a cliff. While I am not afraid of heights (more than the average human being anyway), I find this climb to be a bit scary. You will first walk down through some narrow tunnels in the stone. Then you will start lowering yourself down from very slippery, slick chains, which lead to a ladder and more chains. The steeper the trail, the closer you are to the waterfall and everything is covered in at least a fine layer of water. Go slow and insure that you don’t have anything in your hands on the way. Beaver Falls is down the trail past Mooney about four miles (one direction). Even though you will be tired of hiking at this point (most likely), I would highly suggest continuing on as a day trip from camp. The trail itself crosses the stream several times. It passes through some amazingly beautiful stretches of forest and strange assemblages of desert plants. It is a beautiful trek. Beaver Falls, while not as high as Mooney or Havasupai, is really lovely and the perfect place for a swim. It is often slightly quieter than Mooney, although if you go in the high season, you won’t be able to escape the crowds. I’ve even heard rumors that people have been stuck waiting for an hour to get up or down those chains near Mooney. If you want to learn more about what to explore in Arizona, be sure to check out Nightborn Travel’s guide to Arizona! Fossil Springs Trail is one of the emerging stars among the trails of Arizona. It isn’t all that uncommon to run into pictures of the waterfall and the unflatteringly named “toilet bowl” on Instagram. It will be immediately clear why people from all over the world enjoy this hike. Fossil Springs is truly an oasis in the desert, with its mossy falls and lush riparian trees. The trail into the Fossil Springs canyon will also take you through some of the higher country scrub forests of Arizona. These are absolutely beautiful in conjunction with the wide-open spaces of the drier parts of the state. Of course, if you love hiking, this is a very good trail to explore. You get to experience the high elevation and riparian forests of the state. If you enjoy swimming, there are also some wonderful spots along the creek for a dip, and there is an endless array of photo spots. Access: Accessible with 2WD when dry; parking is down a dirt road with bumps and potholes, but I made it in my Acura RSX which has very little clearance. Difficulty: Moderate – Difficult; This is a long trail with elevation gain on the way out. I didn’t find it to be particularly steep (1,500ft over the course of 4 miles), but I hike regularly. If you want to hike the Fossil Springs Trail during more mild weather, you will most likely need a permit (April 1 – October 1). But if you have 4WD and are prepared for snow hiking, you can also go hike the trail without a permit from October 2 – March 31. In any case, if you plan ahead, it really isn’t difficult to get a permit. Just go to the Recreation.gov website and see if there are any available for your dates; you can buy permits a month ahead of time. If you want to go more than once in a year, you are allowed to hold one permit per month. Permits only cost $6 per vehicle. There are multiple trailheads/parking lots, but I would suggest reserving your permit for the Fossil Springs Trailhead near Strawberry, AZ. For those of you looking for hiking near Payson, AZ or coming up from Phoenix, you will need to drive north through Payson on the 87. You will pass through the small village of Pine. Then in Strawberry you will travel west on Fossil Creek Road/FR 708. Five miles down this road, and you will turn right to get to the parking lot. Before you are able to park, you will need to have your permit checked. So, be sure that you follow all instructions on Recreation.gov and have your paperwork ready to go! Depending on where you are coming from, you might need some slightly different directions, or you might be heading to a different trailhead. Whatever the case, the Recreation.gov website will have more information for you. In my mind, there are two sections of this trail. The first part takes you down from the parking lot and into the canyon. The incline wasn’t horrendously steep and the trail itself is pretty wide until you get close to the creek towards the bottom. Much of this first section is shaded by the trees and shrubs that characterize the open forests of most hiking near Payson, AZ. You will also get to enjoy the beautiful red soil that you can find throughout this area beneath the Mogollon Rim. This is a lovely place with great views of the landscape and canyon. It is also the harder part of the trail, and that sort of makes it something to be pushed through. You will come to the second section of the trail when you reach the bottom of the canyon. Here the trees transition from the higher elevation forests to the riparian ecosystems that make Arizona water-side places so special and vibrant. The trail gets pretty flat at this point. So, I like to amble along this section, stopping to take pictures, eat snacks, and swim. While most people head straight for the dam and the “toilet bowl” I would highly suggest that you take your time and enjoy it all. There are plenty of spots to take in the spring, snap pictures of the beautiful forest, and rest up before you have to start your journey back up the canyon. While I did not find this trail to be particularly dangerous or strenuous, many many people underestimate what it takes to hike something like Fossil Springs Trail. In 2017, first responders were actually overwhelmed by the number of people needing to be rescued from this area. Accidents happen, and even the best hikers can get hurt and need rescuing, but you have to do everything in your power to stay safe and not be a part of this problem. Here are some tips for staying safe, but remember that your safety on the trail is up to you. Be careful and prepared at all times. (1) Know your abilities. If you are planning on going on this hike, practice beforehand. Know that you can hike 9 miles round trip with the elevation gain. If you aren’t ready, wait and do it after you have had time to prepare your body. (2) Always bring food, water, and first aid supplies with you. Plan on bringing enough provisions for an entire day, and if you are unsure, there are outdoor first aid kits specifically sized and designed for the length of trip and number of people that you can get at REI. (3) Start early in the day, even if you aren’t a morning person. This will give you more time if you need to take it slow on the way out. You don’t want to still be on the trail at night, but bring a small light just in case. (4) WEAR GOOD SHOES. You should wear hiking shoes for the Fossil Springs Trail, and you need to have broken them in before you go. Do several hikes in a new pair of shoes before taking them out somewhere as remote as this. (5) Unless you are a very practiced hiker, do not do this hike alone, and insure that all of your hiking partners are prepared. (6) Pay close attention to the weather. Arizona is a place of extremes and this can be dangerous. When it is hot and dry, you need to make sure that you stay hydrated and have healthy levels of sodium (bring salty snacks). And when it storms, it STORMS. Fossil Springs is in a canyon and thus there is a risk of flash flooding. Before you leave, make sure that you pay attention to the conditions and plan accordingly. You may need to cancel your trip if the weather is looking really bad, but better to cancel than end up getting hurt or worse. (7) If you are going swimming, remember that you are out in the wild in moving water. Make sure that you are a strong swimmer, are going with other people, and pay attention to your level of exhaustion. Yeah, I went to Fossil Springs Trail before it was cool. Hahaha, but it wasn’t like that. I was a kid at the time (5 or 6 maybe? It’s one of those fuzzy memories that I have, probably from right when I started remembering things), and my dad and I hiked down to the creek to camp. I can’t remember exactly where this was in the canyon, but I believe it was on the opposite side of the canyon than the trail I’ve described above. It was a lovely day, but unfortunately, this was before the internet, and we ended up getting stuck in a storm. Consider this a lesson in things not to do… and a reality check about how dangerous weather in these canyons can be. I loved the creek as a child, because I’ve always been enchanted by flowing water, having grown up in the desert. I remember playing among the trees and along the water, and at the time, there were no other people camping or hiking in the area. We had this beautiful place all to ourselves and the day stayed bright and clear until sunset, when the clouds started to creep in. We managed to finish eating dinner before things started getting dark and stormy. The rain didn’t start out particularly hard, so we hunkered down in our tent and hoped for the best. Luckily, my dad decided that we needed to abandon our campsite as soon as it was clear that the creek was rising. By this point, it was pitch dark, and I remember clutching to a little stuffed animal that I had brought with me, protecting it from the rain as best I could. My dad packed up everything he could, and then led me straight up the canyon, towards the road. Now that water was pouring down, we had to claw our way up through the mud, to avoid the rising water. We managed to make up onto the road, and we were out of danger from the rising water at that point, but we were turned around in the dark storm and we weren’t sure what direction our vehicle was. I don’t remember well enough to say what the temperature was at this time, but being soaked and lost in the dark is never a pleasant experience. Again, luckily for us, my dad’s sense of direction was spot on, and after a bit of walking down the road we made it to our vehicle. Now, we get to look back at this memory and laugh, but imagine if things had gone differently. If we had fallen asleep in the rain, we might have been caught in the flood. If we hadn’t turned the right way, we would have had to spend the night in the storm, and potentially face hypothermia. Back then, we couldn’t go look up the weather in Payson-area online, and we didn’t have a cell phone; but now we don’t have those excuses. That’s a lot of information on safety! Is this trail really that dangerous?! If you are interested in hiking Fossil Spring Trail, just make sure that you are prepared. This is a great, beautiful hike. It is also one that has been plagued by people getting themselves into situations that they couldn’t get themselves out of. I’ve been traveling to Disneyland regularly since I was little. It’s one of my favorite places, and despite the growing crowds, I still love going. It’s odd, in light of my long track record of just going there, that there are so many detailed and lengthy guides for this huge California attraction. Looking at all this information, one would think that a trip to Disneyland requires months of planning and a budget just to buy all the gadgets that you will need before you even leave. So, can you do last minute Disneyland if you don’t live in the area? Heck yes! Obviously, if you have kids, that makes things a little more complicated, but a trip to Disneyland can be simple and fun. Whether you’ve never been before or are an old pro trying to simplify, here are my Disneyland secret tips for a great time sans too much planning. The main barrier to entry is of course, the ticket price. Seems like every year Disney increases the cost of a day at the park, so before you commit to going, always make sure that you update yourself on the current price for tickets. If you are on a budget, that will likely determine how long you can go for and that will influence every part of your last minute Disneyland plan. The most recent pricing scheme will make tickets more expensive during peak season, so factor the potential extra cost in. You can get up-to-date prices here: https://disneyland.disney.go.com/tickets/. While purchasing tickets you might also want to consider whether or not you’d like to pick up the MaxPass. This is an extra $15 and allows you to pick up FastPasses via an app. In theory, you can maximize your time this way and pick up passes faster than people without, although you are still limited to one active FastPass at the time. I am on the fence about this service being worth the money, although primarily because I experienced a service outage that lasted an entire day- making the MaxPass worthless. Luckily, if you just don’t think it’s worth it, or don’t have the extra cash, FastPasses in Disneyland still work if you bring your ticket to the kiosk at the entrance of the rides. There are loads of hotels around Disneyland, and as you might expect, some are more expensive than others. For those budget travelers among you, more distance between the hotel and the park means bigger savings, but you’ll need to find something that makes up for the cost of parking (if you aren’t willing to hoof it). If you park at Disneyland, you will be paying upwards of $30 a day. I’ve had some great luck with Hotwire for finding good deals in the area, but I will say, when it comes to finding a hotel that’s affordable but nice, you generally need time. This is one part of a last minute Disneyland trip that will be difficult for people on a tight budget. You have a few options for transportation and the most budget-friendly method will depend on where you are staying, but all can work for a last minute Disneyland trip. My favorite thing to do is stay close enough that I can walk to the park, and plenty of the hotels in the area have free shuttles. If neither of those work for you, Lyft and Uber can be a great way to get to the park without having to worry about parking. However, method will only be cost effective if you can get there and back for less than $30- that’s the cost of parking at Disneyland. One of the most budget-friendly Disneyland secret tips is that you can bring your own food and water into the park. While I love to eat all of the increasingly delicious foods in Disneyland, meals and snacks add up really fast, especially when you have kids with you. If you are all about trying all the good foods, you can also save a little bit of cash by bringing a refillable water bottle in with you and filling up at fill stations and water fountains. I have most recently become a Disneyland food fanatic, so I more than understand if you’d like to spend on some extra cash on food. I’d highly suggest checking out the Wonderful World of Food on Youtube. They put out seasonal guides to all of the great treats and meals that you can try in Disneyland and California Adventure. My favorite Disneyland secret tips are to try to spend a couple days mid-week in the park. These tend to at least give you a little bit of a break from the crowd, particularly in the morning. Quieter times in the park are the best times to jump in as many lines as you can before they get too long. Usually, I visit the park for 2-3 days, coming up from outside of LA. Of the two parks, Disneyland tends to be the more busy of the two (especially with the Star Wars section of the park opening in 2019), so I’d suggest going there first especially if that is the only weekday that you can swing on your last minute Disneyland trip. I can always spend more than a day in Disneyland, so if you feel likewise, you might consider returning for a second half-day or coming back for a third day. For you roller coaster riders, get fast-passes for Space Mountain, Splash Mountain, Indiana Jones first. On the second day of your trip, take a little breather from the crowds and go to California Adventure. Overall, if you haven’t been before, this park doesn’t have quite the history or atmosphere of Disneyland, but it is becoming increasingly well-themed. If you like big rides, the fast passes to go for first are the Radiator Springs Racers, the Incredicoaster, and the Guardians of the Galaxy. …be sure to check out our Guide to California. If you are looking to do a more thorough exploration of Southern California with Disneyland included on the itinerary, we also have the perfect travel plan for you. Greetings, hungry explorers! It’s another segment of Food Finds, hot out of the oven. If you haven’t joined us at the table before, this is our guide to great food (usually local to Arizona). Today, we’ve got the scoop on El Chullo, Peruvian Restaurant and Bar. If you read our last Food Finds about cozy Cambodian restaurant Reathrey Sekong, El Chullo is even cozier. This little Peruvian place is tucked into the corner of 7th St. and Virginia Ave. in mid-town Phoenix. The tables and bar seat MAYBE 30-ish people max., so if you’re bringing in a larger party (or really any dining party, especially on a weekend), call in and make a reservation. For such a tiny tavern, they have a pretty wide variety of appetizers and entrees on their menu, so if you have questions (and had never tried Peruvian food before like us newbies), just ask your server. I’d also ask about their beverages that have a Peruvian twist, like Inca Kola. Honestly, this golden soda was a little intense on the flavor scale for me – but if you’re a fan of lemon verbena (it’s main ingredient), this is the cola (or Kola) for you. I’d describe these dishes as comfort food, both hearty and warm. They also definitely don’t skimp on the portions. But, if you do still have room after these generous plates, don’t forget about dessert! We tried the alfajor – a cute little cookie with a creamy dulce de leche center. It’s one of the desserts they are known for! So if you find yourself in Phoenix, give El Chullo a try. We also heard that they might be opening up a second location not too far away on 7th Ave. sometime soon, so it’ll be even easier to sample some of this Peruvian goodness. That’s it for this week’s Food Finds, but don’t be stranger – we have more on the horizon!